We all have caught up on the new Fad, ie. the Selfie fever, and its catching up like wildfire.From teens to adults, to aunts , all saturate their socials with selfies, so much so, that the Oxford dictionary named selfies, as the word of the year in 2013. So when there are all sorts of selfies yet to be witnessed ahead, what if I tell you I have just the app for you to make this seemingly endless trend more fun and lets you live in the moment ? Let me introduce PicPal to you. 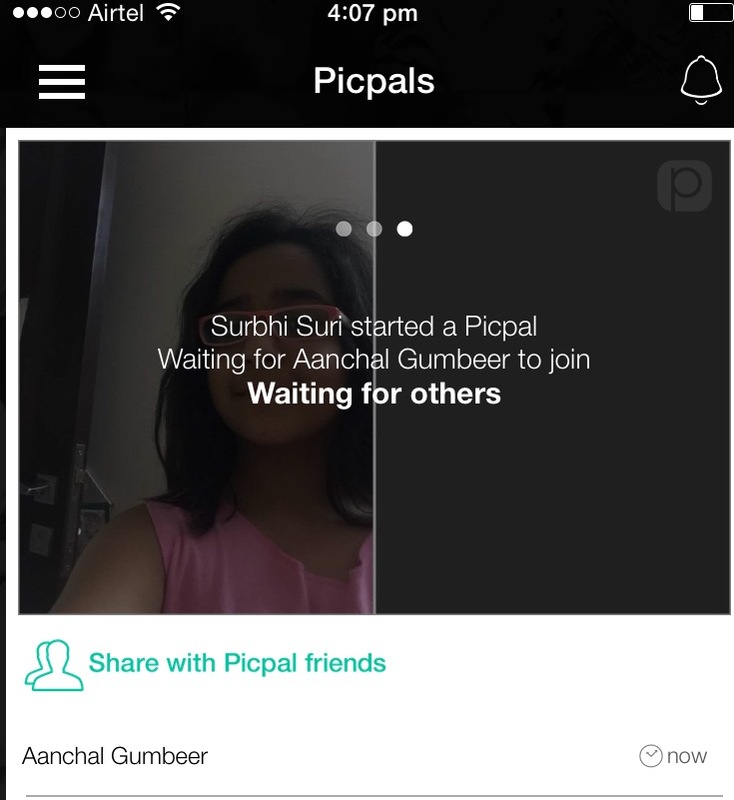 PicPal is a fun selfie sharing app that allows us to take selfies with our loved ones, who are particularly distant at a time. No matter whatever the circumstances are , nothing could be more happening to capture moments on the go . Especially for those who love to take selfies every now and then. Now you can do all this in real time, simultaneously, even while your loved ones are not around and keep up with your long distance relationships. Picpal is a fun place to share real time photos with your family and friends and then leave the rest for the app to give you a a single collage with everyone in it. Yup, you and your friends, all in a single frame, together. So no more missing your friends. How To use: Just sign up using facebook. 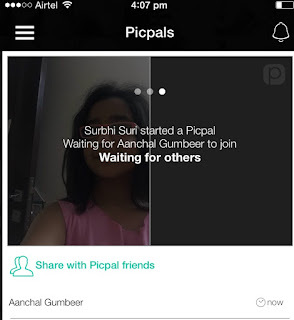 if your friends are on Picpal, you can see them on the apps as Picpal contacts. You can send them an invite to connect and start Picpaling. Once asked to join, They would see a notification alert like this . As of now in the current feature, your friends have 15 mins to join you in the app, and make sure u have asked them to enable push notification so that they can see alerts when their friends send them one. Its easy to just launch the app and go. Just tap the start button screen. Once you are done taking your pic, now you can select and invite your friends to take theirs. To test this fun app, I decided to do Picpal session with my toddler nephews, who are staying in London. Of course with the help of their parents. They paid us a visit six months back, and I thought it would be interesting to be in touch while I try out the app too, and create some fun collages with the kids in the frames for memories sake . So in a nutshell, you invite your friends, take selfies separately and leave it to Pic collage to bind the rest. This is just a glimpse of what we did. And we could not stop at taking just one . Sharing: Share your PicPal collage/s within the app with your friends, or post them online for other people to see like and comment. Your friends can make you feel loved by hearting, liking and commenting on the pics ( which I am guessing its the first app I have come across ) It's like a perfect collage app with a Pic chat feature which specializes in keeping communication personal , unless we want to share publicly. So gone are the days, when selfies were just a screenshot of your video chatting. We have arrived past that and while our phone may have every app to lessen the distance with our dear ones, but nothing is as real as feeling real, and Picpal gets this feeling delivered right when you want to. You can now download Picpal on both Android and IOS devices.